June 22, 2011 /Photography News/ NASA's Cassini spacecraft has discovered the best evidence yet for a large-scale saltwater reservoir beneath the icy crust of Saturn's moon Enceladus. The data came from the spacecraft's direct analysis of salt-rich ice grains close to the jets ejected from the moon. 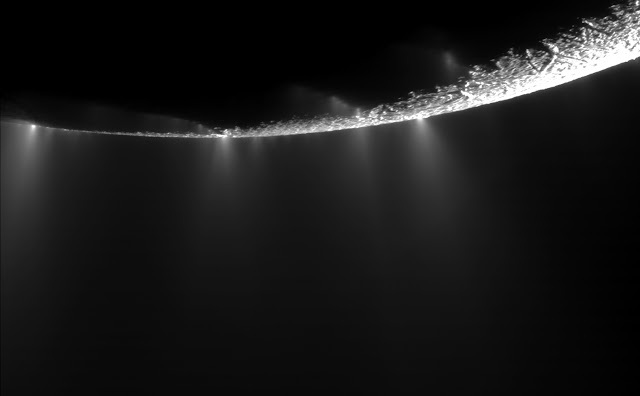 Dramatic plumes, both large and small, spray water ice out from many locations along the famed "tiger stripes" near the south pole of Saturn's moon Enceladus. The tiger stripes are fissures that spray icy particles, water vapor and organic compounds. More than 30 individual jets of different sizes can be seen in this image and more than 20 of them had not been identified before. At least one jet spouting prominently in previous images now appears less powerful. This mosaic was created from two high-resolution images that were captured by the narrow-angle camera when NASA's Cassini spacecraft flew past Enceladus and through the jets on Nov. 21, 2009. Imaging the jets over time will allow Cassini scientists to study the consistency of their activity. The south pole of the moon lies near the limb in the top left quadrant of the mosaic, near the large jet that is second from left. Lit terrain seen here is on the leading hemisphere of Enceladus (504 kilometers, 313 miles across). Cassini scientists continue to study the question of whether reservoirs of liquid water exist beneath the surface of the moon. The view was obtained at a distance of approximately 14,000 kilometers (9,000 miles) from Enceladus and at a sun-Enceladus-spacecraft, or phase, angle of 145 degrees. Image scale is 81 meters (267 feet) per pixel. "This finding is a crucial new piece of evidence showing that environmental conditions favorable to the emergence of life can be sustained on icy bodies orbiting gas giant planets," said Nicolas Altobelli, the European Space Agency's project scientist for Cassini. "Without an orbiter like Cassini to fly close to Saturn and its moons -- to taste salt and feel the bombardment of ice grains -- scientists would never have known how interesting these outer solar system worlds are," said Linda Spilker, NASA's Cassini project scientist at the Jet Propulsion Laboratory (JPL) in Pasadena, Calif. The Cassini-Huygens mission is a cooperative project of NASA, the European Space Agency and the Italian Space Agency. The mission is managed by JPL for NASA's Science Mission Directorate in Washington.